CCleaner is a simple way to enable, disable, or completely remove startup entries. Follow along as I review the steps for Microsoft Windows. A common behavior of Windows applications is to add themselves to your Windows Startup process to ensure they run each time your system boots. They do this for several reasons; auto-update processes, launching anti-virus updates just to name a few. The problem, however, is most applications have no business running at startup. All they accomplish is slowing down your computer and extending the boot process from seconds to minutes. Depending on your Operating System, there are several tools you can use to remove apps from your startup process. For example, Steve wrote an article for our Windows 7 users explaining how to disable startup items using MSCONFIG. We’ve also recently explained the process for Windows 10 and Windows 8 users. Today however I’m going to use one of my favorite tools, CCleaner, to get the job done. That’s right. 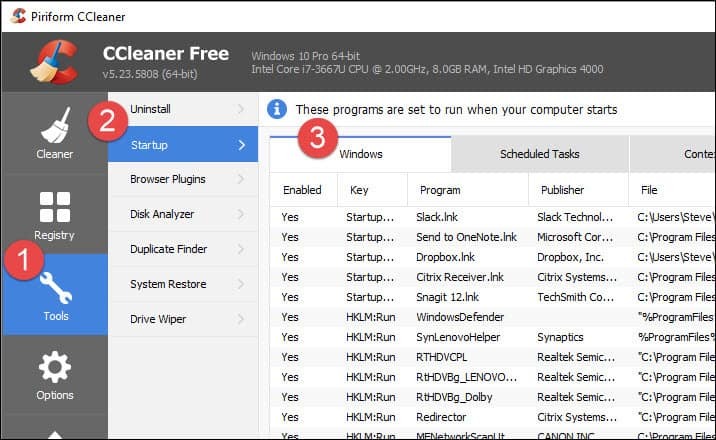 Not only can CCleaner securely delete files and clear your browser and application cache, but it can also manage your startup files. Step 2 – Click the App(s) you want to disable and Click Disable. Note: If you don’t recognize an app, use the Publisher and File path to help identify it. 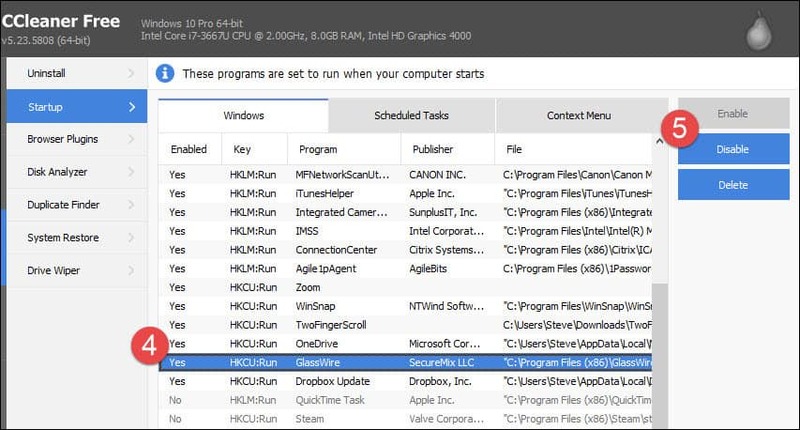 This is a great feature by CCleaner that helps identify all the apps in the startup list. In most cases, you should be able to disable most apps without causing any issues to your system. That said, be sure to reboot after you disable a few apps. If your apps are not working correctly, repeat the steps above and re-enable the app. Do be cautious however if you delete an app from the startup. If you delete an entry, there is no undo button, and it can be a real pain if the program doesn’t have the option to add itself back. CCleaner is a simple way to enable, disable, or completely remove startup entries. The program is free, and it also has several other features I’ve found extremely valuable over the years. Recently they updated it to include support for Microsoft Edge and even better support of Firefox. Stay tuned for more tutorials on its other free features. Yep, agree CCleaner is an excellent tool to tame startup programs. Others that I have found to be very good are CodeStuff Starter and System Internals Autoruns. In Windows 10 you also have the Task Manager to fall back on. I have this program to clean up registry and browsers, but I also have another free program “Glary Utilities 5”. This one shows Startup Programs (I have 5 of them), Scheduled Tasks (75), Plug-Ins(5), Application Services (14) and Windows 10 services (50). It also shows Boot Time in seconds. The main question is – which of the programs, tasks, plug-ins, application services and windows services I can disable to reduce boot time? I asked the customer service, they sent my question to engineers and I did not get any answer. As a result of my activities with Win 10 my pc boot time now is 49 sec but I remember seeing even 15 sec before. Any Ideas? @mikeandmila. For safe tweaking of Windows 10 services google Black Viper.com – the person that runs the site has been doing this for eons and knows what he’s on about. Create a restore point before tweaking – always good practice! As for the registry cleaner component of CCleaner (or any other program offering to clean the registry) steer well away from them. A few redundant entries are much more preferable to an in-operative system as many of these cleaners can delete important registry entries. CCleaner at least gives you the opportunity to save a copy and is fairly conservative in its approach to cleaning the registry. As for a faster start up of your computer, in power options do you have “turn on fast startup” enabled? If not, try it out. 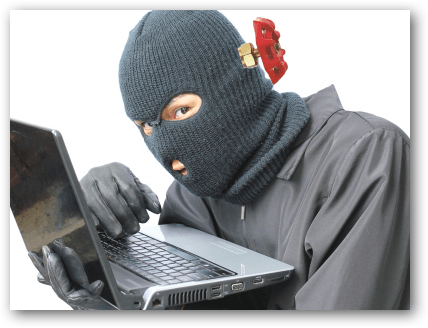 Google fast start up windows 10 – there are plenty of safe sites that show you how to do this. I don’t believe that C Cleaner was ever meant nor suggested to be used to adjust services and I agree that basically using the registry cleaner is really inconsequential as the items it safely removes could just as easily be left as they occupy little space on any current sized HDD. However, equally unlikely is the necessity of doing the BU with C Cleaner as what it does remove is basically innocuous. For those that are concerned about time used to boot their machines, particularly if running W10, simply time it and then read the paper or get a drink (cold or hot) and relax provided losing 90 – 120 seconds of valuable time if just not to be spared. Ccleaner is one of those apps I install on every box.Thanks for the tip on securely deleting files. Didn’t know that. 2. Although I noticed that all the “yes” items were in order, that is not what happens when the program is started. In order to put all the “yes” items in order. Click on the word “enabled” once and then click on it again and then all the “yes” items will be in order. 3. Keep in mind that with most computers now coming with 8 GB and sometimes 12 or 16 GB of RAM, it is rather in consequential as to how many items you open at startup. Keep in mind that if the program is used frequently or daily, the auto start by Windows is much faster to start a program than the user delving into the desktop icons etc to start the program that may be used. Less frequently used programs can then simply be pinned to the taskbar and run from there. C Cleaner is a very good program and not as invasive as others cleaners and can be tweaked to the users desires and should be but with some helpful instruction. Looking forward to your suggestions in this regard as that would be useful for folks that don’t know or are unable to find appropriate assistance. Great feedback Murray. Thanks for the comment! You can find more tips for CCleaner at https://www.groovypost.com/tags/ccleaner/. You will notice I’ve not written about the tool for a few years. However, I’ll be both updating those earlier articles and posting some new ones like the latest versions of CCleaner have some nice new features included. Stay tuned! Steve I looked at the link but find that some of the things I have adjusted in C Cleaner are not mentioned in any of those articles and also note that they are about 5 years old and there have been some changes to C Cleaner and some of the articles may not be pertinent. There are other things that C Cleaner does by default that users may not wish to do but which, again, that C Cleaner allows to not occur if selected unlike some other cleaner programs. Just a few items I will mention. Under the Windows Tab, I only check the Internet Cache and Session in Edge which I seldom use anyway. I particularly wish to keep Recently Typed urls and Saved Form Info but never save passwords in any event (not a good idea for any user to do so). Chrome — only item checked is cache and I could leave that alone too. Moving to Options — Settings I leave alone the items related to the Recycle bin and allow for auto update checks but have no reason not to use C Cleaner manually and not when the system boots. Some cookies are great to keep as they will be of value depending upon personal surfing habits. Under includes/excludes — chose the files/directories based upon personal needs. Under Tools, it has been discussed about Startup and o/w I leave defaults and unless you are confident about exactly what you are doing, don’t get involved with Drive Wiper but it is there if you need it but spend time learning exactly what it does. One of the best things about C Cleaner is that in the Name Bar, all the basic info about your computer is shown and that is valuable if you are in a room such as PC Tech in Paltalk where admins are spending their donated time in assisting users with difficulties they may be having with their systems. I been using CCleaner for 4-5 years on my Mac and my Windows 7 professional wonder what else I’m ahead of. When I try to disable or delete AVG startup files/programs I get an error box that says: Access denied. Will not work. Help!! Please!